Often ignored in Goa, the Paradise tree (locally called the Lakshmi Taru) is a tree that is evidence of the generosity of nature. The tree, which has the scientific name of Simarouba glauca, has benefits in immense proportions. Sandra Fernandes, who has an NGO called Green Growth Institute at Sangolda, vouches for the Lakshmi Taru with passion enforced by personal experience. ‘How can I recommend this tree to others if I haven’t felt the benefits of it myself in the first place? !’ she says. Crediting the late Fr Inacio Almeida with encouraging her work and passing on his research on the Lakshmi Taru to her, she is visibly emotional as she speaks about the priest and his efforts to increase people’s awareness of the boundless goodness hidden in every part of this tree. 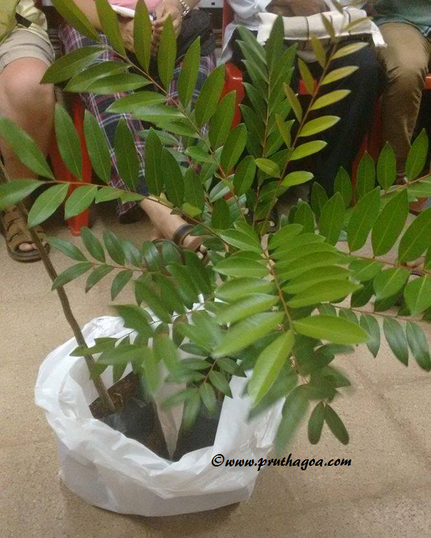 The tree was not originally endemic to India and was brought into the country in 1960 in the form of tree seedlings for the purpose of research in Maharashtra. In 1992, the research done by Prof Shyamsundar Joshi and Shanta Joshi resulted in saplings of the tree being distributed in other parts of India. The foremost advantage of this tree is its medicinal properties, most obviously seen in its fruit and leaves. Sandra says, ‘The leaves can be used to make a tea. You can have it with sugar or lemon juice but don’t add tea leaves. Just make a tea of the Lakshmi Taru leaves and drink it. Be sure to do this on an empty stomach. If you forget, don’t try to make up for it. Skip it. You can do this up to three times a day: before breakfast, lunch and dinner.’ The tea acts as a coolant and a general tonic.’ Sandra has tested it on herself and verifies its potency. She was a chronic sufferer of the classic migraine headache and was abusing painkillers to quell the effects of the migraine. Finally, she decided to put a stop to the painkillers and began drinking tea made from Lakshmi Taru leaves. Soon she experienced relief and has no symptoms of migraine any more. This miraculous tree claims the effect of curing diabetes, a major modern day killer in our nation. A powder made of the seed that is found in the nut is said to be the godsend medicine. The powder of one seed washed down with a glass of water, again on an empty stomach one hour before breakfast, does the trick. Sandra says, ‘Doctors from the Manipal Hospital in Dona Paula used to send diabetes patients to Fr Inacio. He used to prepare the powder and make packets of the leaves to sell. If the patient could not afford it, he would give it free of cost. Whatever money he had, he put into other projects. This is how this man lived his life.’ Despite the organic nature of the medicine, Sandra warns against doubling the dose to hasten the process. It is a slow to work but does so effectively. Warning: Please use discretion in employing the medicinal properties of the Lakshmi Taru. Do not increase the dosage to hasten the healing process as it could be detrimental to your health. Shade dried leaves or sticks ie rachis about 5 cm in length. The amount of leaves or sticks to be used has to be estimated at one leaf or stick for 10 kg of body weight. Chop the leaves or sticks into small pieces and boil them in 200 ml of water in a stainless steel vessel. Boil this mixture for around 10 minutes on a low flame. Do this at night so that you can leave it overnight, covering the utensil with a stainless steel lid (stainless steel is less prone to leaching). In the morning, warm the decoction and filter it. The warm filtrate should be sipped slowly on an empty stomach about half an hour before breakfast. Add 500 ml of water to the previously boiled leaves or sticks and boil for 10 minutes on a low flame. Leave it to rest till the evening when the diluted filtrate can be consumed on an empty stomach. Repeat the same process adding another 500 ml of water, etc, and have the diluted filtrate again in the night. Do this for 15 days and repeat the course every six months. For ailments such as cancer, ulcers, rheumatoid arthritis; double the amount of leaves or sticks in proportion to each 10 kg of body weight. Use 150 ml of water for the first concentrated decoction and 150 ml for the subsequent diluted filtrate doses. Do this till the ailment is cured. The leaves and fruit furthermore have the distinction of being able to rid patients of amoebiasis, gastritis, stomach and intestinal ulcers, and even malaria. A host of quassinoids are the medically significant chemicals present in the leaves and fruit of the Lakshmi Taru. Edible oil can be obtained from the nut, is free of bad cholesterol and has about 85% of beneficial oleic acid, which is more than the content of the acid found in olive oil. The oil in its crude form can be subjected to a process call transesterification to produce biodiesel. The oil can be used to manufacture organic soap, shampoo, detergent, cosmetics, paints, candles, pharmaceuticals, etc as well. The pulp of the fruit can be used to make ethanol, besides being converted into squash, jam and medicinal wine. The lightness and termite repelling attribute of the wood of the tree makes its utilisation in producing furniture, toys, doors, packing material and so on a practical choice. The press cake or oil cake left after the oil has been extracted is a natural fertiliser which is rich in nitrogen, phosphorous and potassium. The dead leaves by themselves make excellent manure, elevating the organic carbon levels of the soil. Earthworms have a particular taste for the leaves of the Lakshmi Taru, making them a perfect addition for vermicomposting. The Paradise tree has a tap root system and its leaves are in a pinnate formation. They can be grown in dry wastelands with minimal rainfall (about 300 mm of rain). For this reason it is a good option for replenishing lands depleted of fertile soil (mining land). One hectare of land could easily house approximately 500 trees. The trees grow rapidly during the monsoon season and the fruit is usually ready for picking by April or May. Sandra warns that it is extremely difficult to cultivate the plant from a seed. It is best to purchase saplings at least three-years-old to be planted on your land because only by that age does the tree gain its medicinal powers. It is only after 5 years that you will see the fruit growing. The fruit appears during the rainy months. If grown in exceedingly suitable conditions, the tree is liable to fruit in less than 5 years. Whether the Lakshmi Taru fruit will make its appearance or not, however, depends on the gender of the tree, since they are available as male and female trees. The male tree is as efficacious in its healing properties and usefulness, but one will not derive the value of the fruit and its seed. Eager to spread the medicinal tree, Sandra propagates its positive qualities and had a stall at the recent Konkan Fruit Fest 2016. She says, ‘The trees went quickly and there were people from Bangalore who bought it too.’ This heralds a good sign for the spread of the knowledge of the Lakshmi Taru, a tree that can be used to restore our damaged environment to its erstwhile condition and treat human ailments simultaneously. *This article is based on a lecture by Sandra Fernandes at the Friday Balcao in Mapusa, Goa.